It 'a semi-cured goat cheese, (40/90 days. ), It is obtained only from whole milk goat. 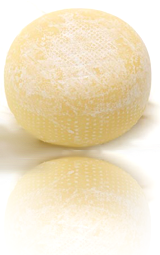 Thin crust, slightly floral, light taste, pleasant aroma with a slightly acidic, typical of goat's milk, much appreciated by those who pay special attention to dietary and nutritional aspects of their diet. To exalt its natural sweetness, we suggest to warm a slice of Caciottina, on bread or vegetables and enjoy it with wildflowers (Millefiori) honey. Tasted alone is very very delicate. Something like very smooth milk.